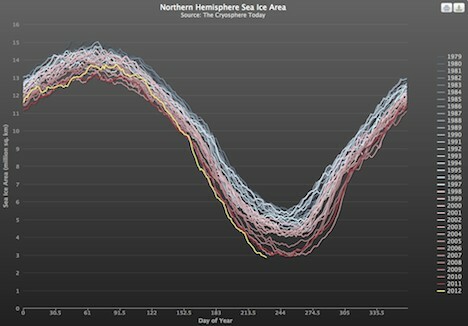 Arctic Ice Heading For Record Low, But Will This News Make Headlines? The world’s Arctic sea ice is very likely to melt to a record low level within a month. But will this vitally important piece of news make major headlines in mainstream media? Unfortunately, the short answer is: most unlikely. As usual, this news will most probably be buried in “environment” , “green” or “science” sections of mainstream media (if they have them at all). Given it’s importance for humanity, this event could and should be front page news worldwide. By mid-September, Arctic sea ice will reach its annual low before beginning it’s yearly re-freeze. There’s nothing newsworthy about that. However, scientists are witnessing a record pace for ice loss this season. We may well be on the verge of a all-time low for Arctic ice coverage. As of August 12, Arctic ice extent had fallen below the level for that date from the record melt year of 2007 (see the yellow line in the above graph). In addition, the crucial Greenland ice sheet smashed the seasonal record-low back on August 8, four weeks before the end of the season’s ice melt. Most mainstream media seems to bury important environmental news, unless it appears to impact peoples lives directly and immediately. For example, extreme weather events do tend to hit local and international headlines when they occur. Any death toll is reported and updated promptly. The phrase “If it bleeds, it leads” springs to mind here. This could well be a reason all the extreme weather events recently reported in the U.S. are leading more Americans to think climate change is real and happening now. In the face of the barrage of record heat waves, severe wildfires, and the worst drought in a century, it’s getting more difficult to ignore the fact that climate change is happening now. This is especially the case now that the links between extreme weather and climate change are being increasingly confirmed and explained by scientists – not that these links are being reported prominently in mainstream media, either. Do you think this imminent news will make headlines in mainstream media this time? I certainly hope I’m proven wrong when the time comes. Image by The Cryosphere Today: Annual Arctic Sea Ice Area. The yellow line at the bottom is 2012.